For an international road surfacing company operating out of diversified locations, the accurate and efficient management of its operations not only ensures smooth running of the company operations but also paves way for company’s growth and building of a trusted brand, among its customers, employees and stakeholders. Yorick van der Walt, the Health safety environmental and Quality Manager is responsible for staff personnel information, safety, training and certification and keeping abreast with the certification required for assigned road surfacing tasks regulations across different geographies. The operations remains tedious using paper and spreadsheets to monitor the operations and staff data, with restricted capability during mobility is a major process hindrance to record data during site visits and while on the go. Accurate and efficient management decision making- as all data is in one place. Effective paper-less operation- saves time and effort. Scope for growth- Database can be enhanced at any time. ”Since developing and integrating our organisations’ Health, Safety, Environmental and Quality systems (all ISO accredited systems) in the Ninox Mobile and Desktop applications, we have managed to align all of the organisations objectives greatly, improving the overall focus on key process areas, reducing product defects, environmental impacts and safety incidents"
Yorick Van der Walt, HSEQ Manager, MMB Surfacing Ltd.
What started as a database for storing & recording employee health & safety information for an MNC working across different geographical locations - 180 employees, in 14 teams, working in 5 different locations, has now escalated to a comprehensive application for managing operations. The entire solution stack is built by Yorick starting with a basic enquiry about Ninox. Yorick is a Health safety environmental and quality manager with no software programming background except from his high school as he lightly shares. Before Ninox, the MMB operations were done on excel sheets and while starting to look for a solution, Yorick started the search with SAP, but not finding the right fit and simplicity of solution, Yorick found Ninox. ”All of our clients have noticed a marked improvement in all areas of our services provided.- Thank you Ninox!" 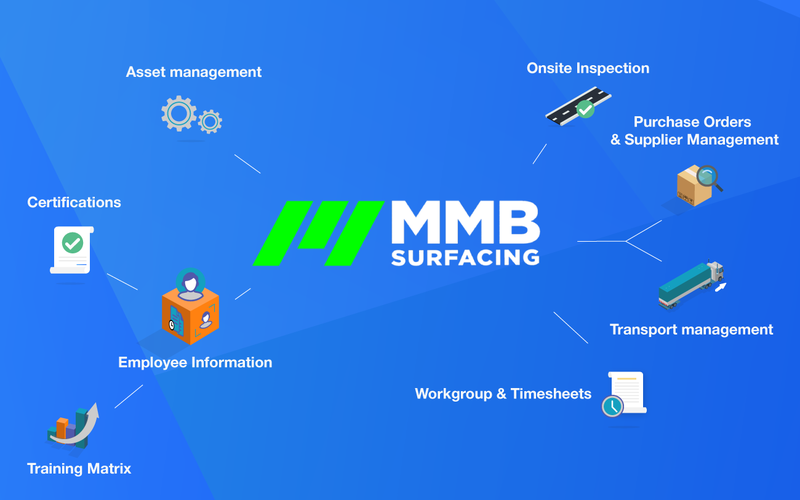 MMB Surfacing team uses from desktops and mobile devices, a combination of Ninox cloud and app for their work. 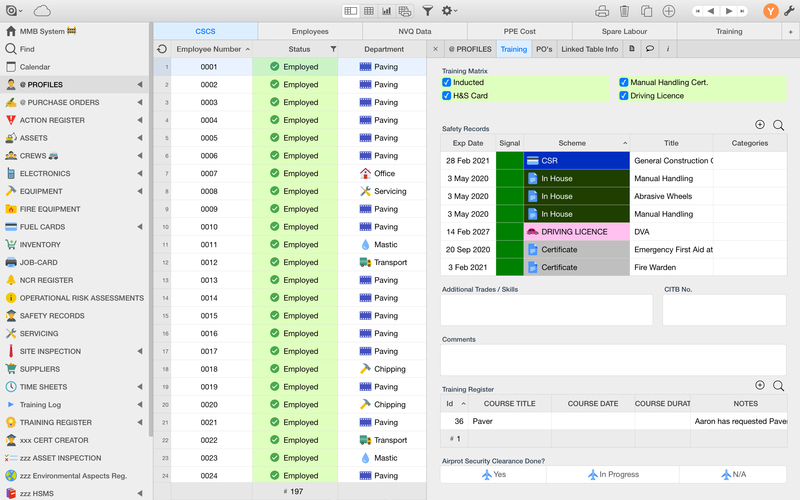 The office users work on Ninox from desktop with web and native mac app, whilst the field users access Ninox from iPad and iPhone via Ninox iPad and iPhone app. Using Ninox from iPad and iPhone app, allows field users to record their data when internet connection is poor or unavailable. The data syncs with Ninox server as soon as internet connection is available. Ninox empowered Yorick to do more and achieve more in his work by digitizing their custom processes and operations which was not conceivable by any off the shelf application in the market. Due to Ninox’s data relation, searching any company’s asset or employee gives holistic view of all events related to that entity including the historical information. Yorick designed custom operations management for MMB Surfacing taking advantage of the flexibility offered by Ninox which allows to add new features easily on existing application i.e. build applications step by step without impacting the existing data. Take part in our Special Interest Group now and help to shape the digital future of your industry. Take part in our Special Interest Group now and help to shape the digital future of your industry. We are pleased to answer your questions about the integration of Ninox and MMB Surfacing ltd.